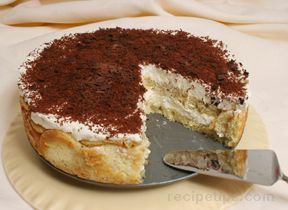 Who doesn't love tiramisu but add in chocolate cake and you'll have a new favorite! Delicious down to the last bite. Perfect for those coffee lovers. Preheat oven to 325° F. Grease and flour 2 8-inch pans. Prepare cake mix according to package directions, pour into prepared pans, spreading evenly. Bake 40-45 minutes, using the toothpick test for cake doneness. Cool 15 minutes; remove from pans and cool completely. In medium bowl, combine cream cheese and powdered sugar, whisking until smooth. 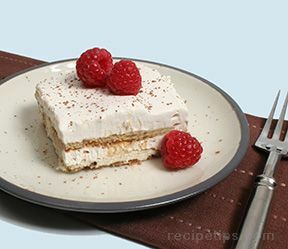 Whisk in sour cream and rum extract. Reserve 1 cup of the whipped topping for garnish. Fold remaining whipped topping into cream cheese mixture. In small bowl, combine sugar, coffee and boiling water, stirring until dissolved. Place one cake layer on serving platter. Brush half of the coffee mixture over bottom cake layer using a pastry brush. 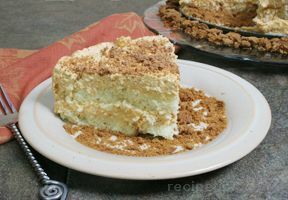 Spread with half of the cream cheese mixture. Grate half of the chocolate morsels over cream cheese layer. Carefully top with second cake layer brush with remaining coffee mixture. Spread with remaining cream cheese mixture. Decorate cake by piping with reserved whipped topping. 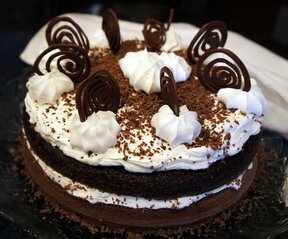 Garnish with chocolate swirls and more grated chocolate, if desired. "Beautiful AND delicious! It doesn't get any better."